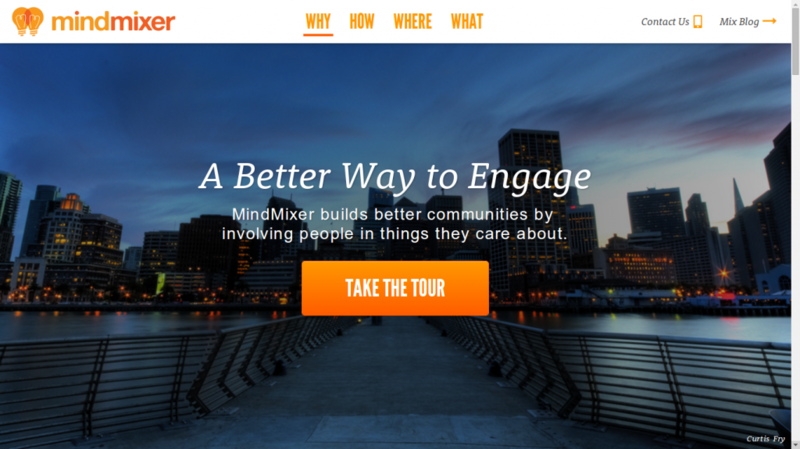 MindMixer is a tool that lets citizens and community planners engage in public dialogues without meeting personally. It was inspired by town-hall-style meetings, where engaged citizens talk to their representatives and expose their views on the decision-making process. Such meetings, however, require the citizens to be at certain place at a certain hour, something that someone with family and work obligations might not be able to achieve. As a result, only a narrow demographic group can attend such meetings regularly and broad sectors of the population can not let their voice be heard. MindMixer addresses this problem and takes the town-hall discussions online, through a web application that connects local institutions with the citizens. Universities, hospitals, and school districts can open conversations about a certain topic and collect the views of the community members. The system gives the city representatives important information about the decision-making process. For example, they have access in the back-end to demographic data of the people who are posting their views. In one particular case there was strong support for extended library hours, however they found out that most of this support came from the downtown areas. This data can lead, for instance, to extend the opening hours of only those libraries at the downtown. MindMixer makes easier for governments to involve the citizens in the decision-making processes and take a wider range of opinions into consideration. For the citizens MindMixer offers an uncomplicated way to participate in the public discussion and let their voice be heard.